Did You Know… There’s A Plant That Produces Both Tomatoes and Potatoes? 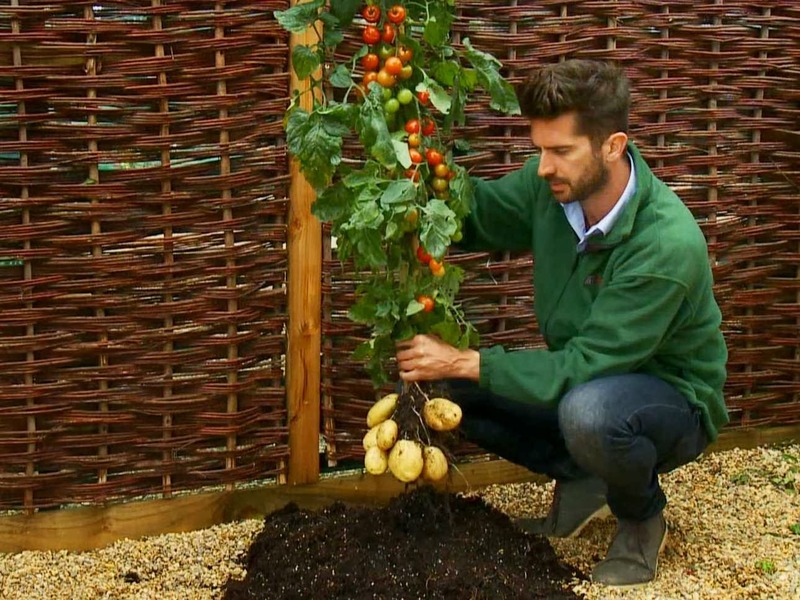 The “TomTato” is a veggie lover’s dream: above ground, it’s a tomato plant; below ground, it’s a potato plant. The idea was the brainchild of the horticultural firm Thompson and Morgan, based in Ipswich, England. Although the concept sounds crazy, the plants are not genetically modified; rather, they are created using grafting. This process involves making matching incisions into two different plants which allows you to connect them. A similar process was recently used by a professor from Syracuse University to create a tree that produces 40 different types of fruit. The current version of the TomTato is the culmination of 10 years of development. Early versions of the plant had issues with taste, but advances in grafting technology have allowed Thompson and Morgan to perfect their process. said Thompson and Morgan director Paul Hansord. According to the horticultural firm, the tomatoes ripen right around the same time that the potatoes can be dug up. Many people in England have their own small vegetable gardens, but don’t have the space to grow as many different types of vegetables as they would like. Thompson and Morgan hopes that the plant will gain popularity amongst these people, and possibly even start a trend towards more vegetable hybridization in the future. If the tomatoes and potatoes really are as good as the company’s director claims, the TomTato could very well start popping in up vegetable plots all over the world. Read the original story from the BBC here. On the Brazilian coast, a couple hundred miles south of São Paulo, lies the small town of Laguna. Laguna is very much like most other small coastal towns in Brazil, with many people relying heavily on fishing to provide both food and income. This interaction is a beautiful example of a symbiotic relationship, one in which both species benefit from cooperation. The dolphins help the fishermen by herding fish into shallower waters along the shore. Once the fish are bunched, the dolphins use specialized head or tail slaps to show the fishermen where to cast their nets. Not only does it make fishing much easier and more effective, it also saves the fishermen the trouble of having to go out into deeper waters to find fish. When the fishermen cast their nets, it startles the schools of fish, causing them to split up and swim in random directions. This makes it much easier for the dolphins to pick them off as they try to escape. The dolphins help provide fish to over 200 families in Laguna who have no other source of income. Over the years, the fishermen have become intimately familiar with many of the dolphins, even naming them. Some of the most skilled dolphins, like “Scooby” and “Caroba”, have been working with the fishermen for more than 15 years. Recently, a group of researchers decided to study the unique interactions. Fábio Daura-Jorge, who works at the University of Santa Catarina in Brazil, was one of the leading researchers. Read more from Live Science here. To the Bayaka people, who inhabit the jungles of the Central African Republic, honey is an extremely valuable commodity. Besides being a rare and delicious delicacy, it provides essential energy and nutrition. So, when a beehive is found in the jungle, some men are willing to take extreme measures to secure the precious honeycombs for their family. Not only does Tete climb without a harness (he uses only a vine wrapped around the tree), but once he gets to the crown of the tree, he still has to battle the angry bees as he carefully makes his way to the hive. Once Tete arrives at the hive, he has to break into the interior. He passes the honeycomb down to his eager family via a basket pulley system. Even bee stings don’t stop his wife and kids from thoroughly enjoying the feast. When you think of the fastest animals in the world, you probably don’t think of salamanders or crabs. Surprisingly however, these two unassuming creatures top the list of the world’s fastest animals. Both share the ability to make lightning-fast movements with different parts of their body. The hydromantes salamander takes the top spot with the animals kingdom’s fastest tongue, and the mantis crab comes in second with a hammer claw that moves so fast it actually creates a compression wave that boils water in front of it. For everyone who came here to see a cheetah in super slow-motion, don’t worry, I got you- watching cheetah videos has been a favorite activity of mine since I was a kid. The peregrine falcon is the world’s fastest bird, and the fastest animal if we’re talking about moving the whole body. These fighter-pilot like falcons assault their prey (almost exclusively other birds) from above, reaching a terminal velocity of 200 mph as they dive-bomb from sky (terminal velocity is the point at which air resistance stops an object from accelerating during free fall). The falcons strike with a clenched fist which either stuns or kills their prey. The falcon then twists in midair to snare the other bird. The situation in Ukraine has been all over the place lately, with conflicting reports constantly coming from both sides, so I don’t blame you if you haven’t been keeping up with it. There have been a few recent developments, however, that are worth noting. 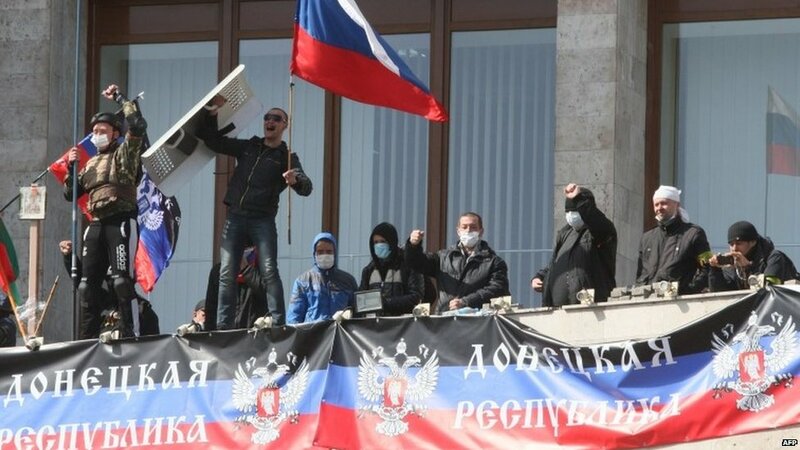 Since the overthrow of former Ukrainian President Viktor Yanukovych and Russia’s subsequent annexation of the Crimean peninsula, there has been significant unrest in Ukraine’s eastern cities, specifically in the coal-mining region of Donetsk. A number of pro-Russian separatist groups have emerged in eastern Ukraine since all the tension began. Though they typically wear uniforms that bear no particular flag and claim to be Ukrainian, many people believe that a significant portion of these groups are actually covert Russian forces. The Donetsk People’s Republic (DPR) is the most organized and most visible of these groups. They recently announced that they would be holding a referendum in the Donetsk region and the neighboring Luhansk region on May 11th. Originally, the referendum was to be a vote on whether or not to legitimize the new Ukrainian government. Then, members of the DPR said people would be asked whether they wanted to leave Ukraine and join Russia, “Crimea-style”. As of May 8 however, the referendum simply asks, “Do you support the act of state self-reliance of the Donetsk People’s Republic?”. DPR representatives have said that a follow-up referendum will be held on the 18th to decide on whether or not to join Russia. The Ukrainian government and the international community have denounced the referendum (as well as the DPR’s self-proclaimed state) to be illegitimate and illegal. However, separatist forces are in control of a number of towns and cities in the region, and have commandeered 80 local schools to hold the votes (the feature image for this story was taken at one of these schools), so local governments have been forced to comply. Then earlier today, the Kiev Post reported that Ukrainian anti-terror forces in Slaviansk had captured a small group of armed separatists who had 100,000 ballots for tomorrow’s referendum that were pre-marked “yes”. The Kiev Post called the group “Kremlin-backed rebels”, but the publication is known to be supportive of the new government in Kiev so it’s possible that their report may be a bit sensationalized. Check out the original report from the Kiev Post here. Read more from the BBC about the upcoming referendum here. About three weeks ago (on the evening of April 14), the anti-western militant group Boko Haram (whose name literally means Western Education is sinful) stormed an all-girls boarding school in the Chibok region of Nigeria and kidnapped 234 female students. There was also a report last week that some of the girls were being sold as brides to their kidnappers for just $12 a piece. 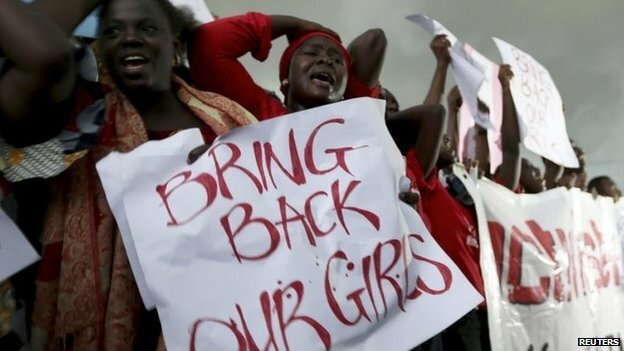 Although Nigerian President Goodluck Jonathon has made speeches assuring that the government will find the girls, it doesn’t seem that much is actually being done, and Nigerians have very little confidence in the government finding the girls. Last week, Naomi Mutah, a representative of the Chibok community from which the girls were taken, organized a protest outside of the NIgerian capital of Abuja. The protestors criticized the government for not doing enough to find the girls and fight Boko Haram. Earlier today, the BBC reported that Nigeria’s First Lady Patience Jonathon called a meeting for those affected by the tragedy- the Chibok community sent Ms. Mutah to represent them. Following the meeting, Ms. Mutah was taken to a police station and detained. The first lady is a very powerful political figure in Nigeria and apparently felt slighted that the mothers of the abducted girls had sent Ms. Mutah to the meeting. The AP talked to another community leader, Saratu Angus Ndirpaya, who was at the meetings. 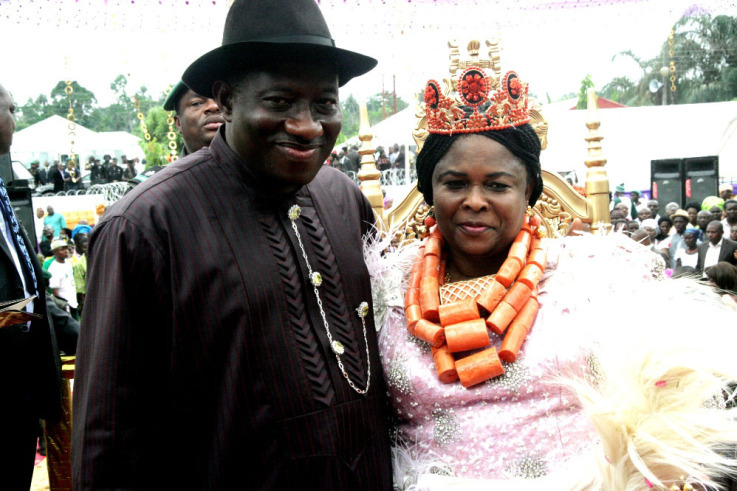 She said that the first lady had accused the activists of supporting Boko Haram, and had even accused them of completely fabricating the abductions to give the government a bad name. On the morning of April 1, 1976, renowned English astronomer Patrick Moore got on the BBC radio station and made an astonishing announcement: Moore said that at exactly 9:47 a.m. that day, the planets of Jupiter and Pluto would align with the Earth. Moore continued, saying that the combined gravitational pull of the two planets would cause a noticeable reduction in the strength of gravity on Earth. He called it the Jovian-Plutonian gravitational effect. The BBC revealed the hoax soon afterwards. Read more about the prank here.